Why this week? In NJ, it is teacher’s convention add to that Election Day and it makes for a week (or almost a week) off from school for the kids. Next up is Thanksgiving then Christmas. What about the weekend trips to see the leaves change? This is what I think about hitting the road…. So, whether you’re going away for a long weekend or just a day, road trips can definitely add to the holiday joy – and stress. But from packing to snacking, Thirty-One has some helpful tips that will have you looking forward to the journey as much as the destination! My husband always jokes about the packing skills. I can fit LOTS of stuff into a small space and still see out the back window. It comes from all of the trips to cheering competitions and craft shows. 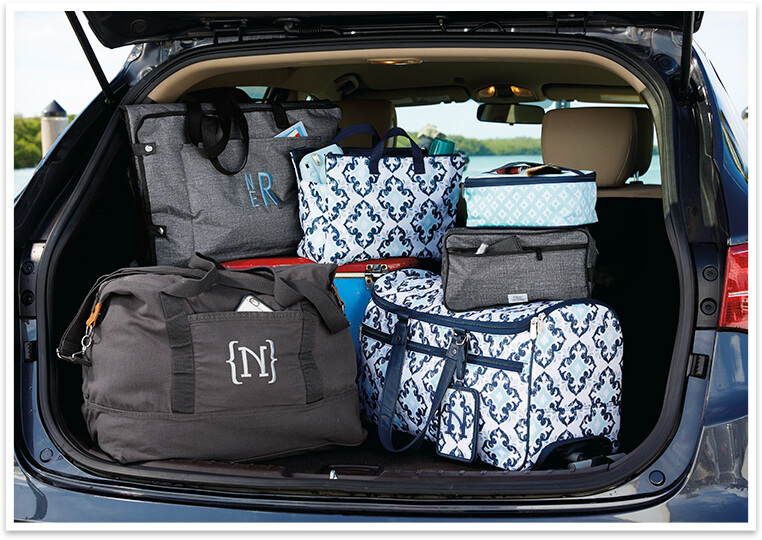 Organized packing can mean fewer bags, and fewer bags means more room to stretch your legs on the long car ride! For your clothes and other essentials, load up a couple of All Packed Duffles or Fold-Over Weekenders. These travel bags are just the right size for holidays away, and their soft edges mean you can squeeze several into your trunk more easily than boxy suitcases. Blankets and pillows are road trip essentials, whether they’re for napping on the way to your destination or extra bedding once you get there. Instead of letting your backseat become a sea of blankets, fold and store bedding in a Large Utility Tote (LUT) in your trunk so it’ll be easy to access during pit stops. You’ll be all set to snuggle up by the fire with family and friends, and LUTs are also great for keeping all of those carefully wrapped gifts safe and sound! Packing toiletries for travel is always tricky, but the Fold Up Family Organizer is a great option to store all your bottles and brushes. The clear zipper pockets make it easy to see what’s where without products falling out during the drive. Packing snacks can help you save money and time on the road. Juice boxes, string cheese sticks and fruit like grapes or apple slices are all easy, no-mess snacks for kids and adults alike, and they fit perfectly in the Fresh Market Thermal. This cooler keeps all your food and drinks secure during long road trips and then folds up nicely once its empty, giving you even more leg room. Or, load it up with holiday leftovers for the trip home! Holiday gatherings usually mean food and lots of it. Whether you’ve whipped up a tasty casserole or some decadent desserts, bring something special to the table with our Perfect Party Set. Just the right size to tuck securely under a seat, this cooler helps you transport all your hard holiday work safely to the table. Audio books or podcasts are a great option if passengers have differing music tastes, and they still let the driver be involved! Download a couple of funny podcast episodes or holiday-themed books before your trip to switch things up from the radio. Plan fun pit stops. If you’re going to be spending hours in the car, map out some fun stopping points that will give you an excuse to get out and stretch your legs. Check online before you depart to see if there are any monuments, bakeries or nature sites along your route. Journal challenges: Get the kids’ creative juices flowing! Give each passenger a Journal Trio journal and some pencils. Throughout the trip, call out challenges like “draw a picture of Grandma’s house” or “make up a story about what Santa does the day after Christmas.” It’s fun for kids to share what they’ve come up with, but it’s also fun for you to think up the challenges! A long car ride in your most stylish holiday outfit? After a few miles, those scratchy sequins might make you wish you had opted for sweats. 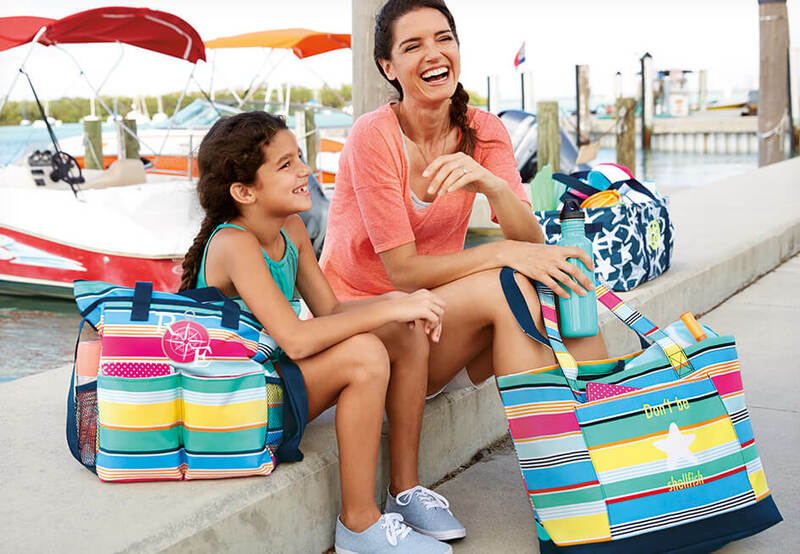 Instead, travel fashionably (and comfortably) by taking your basics and dressing them up with JK by Thirty-One jewelry! Add a little sparkle to a plain sweater with the bold Fringed & Fabulous Necklace or a dainty pair of Gallery Earrings. You’ll feel comfortable and ready to celebrate as soon as you roll up to that holiday party. Keeping your jewelry secure and organized while travelling can save lots of time, headaches and untangling in the long run. Jewelry organizers like the Baubles & Bracelets Case are perfect for separating delicate chains from dangling earrings so that you can have yourself a stylish little holiday. When you’re taking a holiday road trip, every item needs to pull double duty, and that includes your handbag! Travel in style with classics like the Organizing Shoulder Bag or the new Colorblock Tote. These fashionable additions complete any outfit, and no one needs to know that you’ve tucked extra socks or toiletries inside! What hacks help you travel during the holidays? 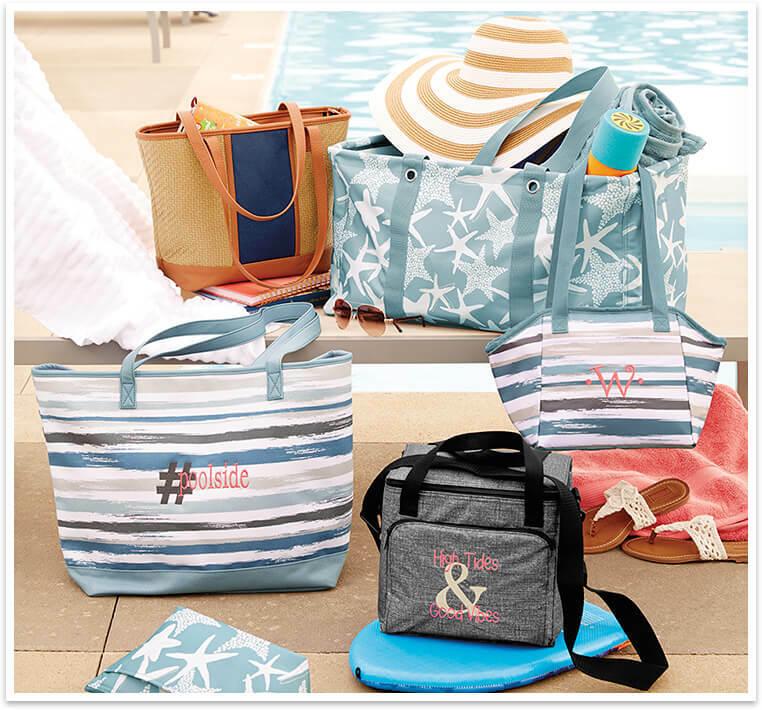 Let us know with the #thirtyone hashtag! Today’s recipe is direct from my Weight Watcher’s Facebook group. It sounded yummy so I wanted to share…. In a Dutch oven or heavy pot, brown meat in oil in 2 batches. Set aside. Saute onions in same pan until soft. Return meat to pan along with remaining ingredients. Simmer, covered, 1 to 1 1/2 hours or until meat is tender. Nutrition Values: 1/10th of recipe (about 3/4 cup): 178 calories, 0.5g total fat (0g sat fat), 432mg sodium, 37g carbs, 8.5g fiber, 13g sugars, 8g protein. In a medium bowl, combine tomato paste, molasses, vinegar, mustard, garlic, and salt. Mix until smooth and uniform. Place all remaining ingredients in a slow cooker. Add tomato mixture, and stir to coat. Do you know the perfect way to carry a crockpot full of yumminess to a picnic? With Thirty One’s Fresh Market Thermal. The Fresh Market Thermal is a stylish, portable thermal large enough to hold two 9″x13″ casserole dishes (and a crock pot). A must-have for family picnics, tailgating, trips to the beach, days on the boat, potlucks, grocery shopping or weekend camping. Its water-resistant Leak Lock thermal lining means you can add ice to this cooler bag to keep food and drinks cold. Need more room? The sides unsnap and expand to give you more space inside. Long handles allow you to carry it over your shoulder when you need to be hands-free. The Fresh Market Thermal also features a zipper closure for securing contents and an exterior front pocket to hold other important items. The weather has been crazy – some days it is freezing cold while others it is close to 60! I love the warmer weather and I know many are thinking about Spring Break or those long weekends, right? Fully embrace the spring break spirit with a spa day in your very own home. First, gather the supplies. Fill a Double Duty Caddy with the scrubs, cleansers, mud masks and other items to make you feel relaxed and renewed. Make sure your Glamour Case has a variety of nail polishes so you can choose the hue which strikes you when it comes time for your do-it-yourself manicure and pedicure. Light a candle, soak your feet and grab a refreshing beverage. Bonus: Now your caddy and case are ready and waiting, it will be easy to create your own at-home spa long after spring break ends, whenever you need a little pampering without the price tag. Take in the great outdoors! You don’t need to visit a national park to stop and smell the roses. Head to your favorite local park or playground and relish a few hours under the sun. Hike the trails, spot some wildlife and make the outing a little more special by eating al fresco. The Picnic Thermal Tote’s zip-around closure makes it easy for you and your companion to pack a picnic lunch, or choose the Fresh Market Thermal when you want to carry enough sandwiches, sides and drinks for the whole gang. Instead of a trip to the beach, stay closer to home! Find the closest indoor pool or water park and spend a day in your swimsuit, come rain or come shine. You might not be able to dig your toes into the sand, but you can enjoy the next best thing when your Essential Storage Tote is filled with snacks, goggles and water toys. Even better? No sunscreen required! See the stars – on the big screen and in the sky. Planning an outdoor movie night add a little bit of pizzazz popcorn alone just can’t manage. Once you locate a projector (pro tip: check your local library), the rest is easy. A mobile movie screen (inflatable or otherwise) is great, but a white or cream-colored garage door or even a large blanket will do. A Zip-Top Organizing Utility Tote is roomy enough to hold everyone’s favorite movies, snacks and drinks with space to spare for outdoor necessities. Keep the bug repellent close at hand in one of the tote’s exterior pockets. Or carry a Catch-All Bin outside, filled with enough candy, napkins and glow sticks to keep even the smallest movie buffs entertained. How far can you go on a tank of gas? Forget the overnight bag and instead explore some of those hidden treasures an hour or two from home. A Crossbody Organizing Tote can fit everything you need for a day on the road – books, toys, snacks, water bottles and even a few diapers for tiny travelers. Best of all, you can throw it over your shoulder and keep your supplies close at hand all day long! What is your favorite type of staycation? Share it with us….. Thank you Hungry Girl for another YUMMY recipe! HG Tips: Look for pre-cut butternut squash in the produce aisle, or click here for squash-cutting tips. And when handling jalapeños, don’t touch your eyes (pepper juice can sting), and wash your hands well immediately afterward.